Jason Roberts 2010 “Luck Surface Area” model explains the need for entrepreneurs to combine time spent doing and developing expertise with time spent communicating with others. It’s a very useful and actionable insight. Unfortunately, the diagram he chose to illustrate the model assumes that entrepreneurs have an unlimited amount of time to do both. I present a revised diagram that assumes total time is limited and that “doing/developing” and “communicating” compete for that time. The amount of serendipity that will occur in your life, your Luck Surface Area, is directly proportional to the degree to which you do something you’re passionate about combined with the total number of people to whom this is effectively communicated. It’s a simple concept, but an extremely powerful one because what it implies is that you can directly control the amount of luck you receive. In other words, you make your own luck. 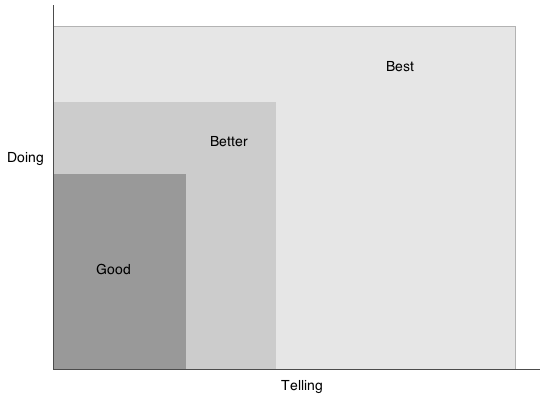 Jason offers a very simple but very useful model: Luck = Telling x Doing. Very simply if you increase the time “telling” and the time “doing” you will increase your luck surface area. The more “telling” and “doing” moves you through the good, better and best luck state. Intuitively this makes sense. If you are developing a product then the more telling and doing increases your chances of product success. 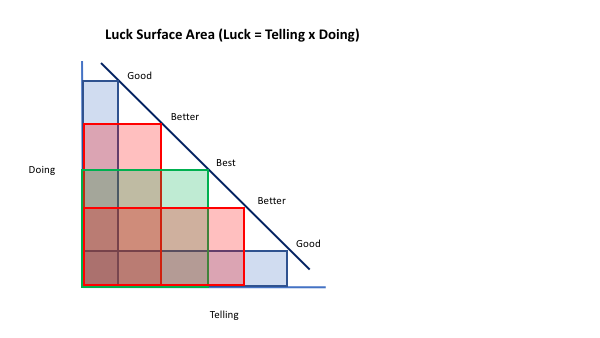 A revised “Luck Surface Area” model that recognizes that entrepreneurs limited time. Jason’s model assumes you have as much time as you want for communicating and doing to increase luck. Realistically you have a limited amount of time and energy that you must divide time between communicating and doing. So, how does luck change based on how much time you spend on communicating verses doing? More communicating comes at the expense of less doing and vice versa. You increase your luck surface area with a balance of doing and telling. At the extremes just telling and not doing and vice versa won’t get you very far. If you enjoy doing but are less comfortable communicating with others you may need to spend more time on communicating (which involves is not only telling but listening). The reverse is also true. What is the minimum amount of time needed in one setting or period to be minimally effective at communicating or doing. Development tasks typically have a setup time and benefit from few or no interruptions for concentrated mental effort. A morning spent recovering the context on a coding project is not a long enough focused effort to make progress. Consider the times of day and days of the week when you are most productive at doing. If they conflict with times that others are available for a conversation you will need to balance working at a lower productivity vs. a lack of progress on outreach and communication. You can make more time available to telling and/or doing by cutting back on sleep, time spent with family and friends, exercise, and other activities that are important to your overall health and well-being. Most projects look more like marathons than sprints: avoid the temptation to work at an unsustainable pace unless it’s truly to sprint against a short deadline or to respond to a bona emergency. Schedule Time and Look at Results as Much as Efforts. It’s useful to schedule both your doing and your communicating tasks and to keep track both of time spent and results achieved. If others are excited about what you are creating but development progress has stalled it may be prudent to slack of on further communication efforts and focus on getting something ready to ship. Conversely if people are not really aware of what you have already developed but you want to make it “more better” before you start talking about it you may be falling into a “100% doing” trap. Conversation and written communication can benefit as much from uninterrupted time as writing code or designing hardware. You may benefit clustering a set of short tasks into “housekeeping” blocks of time where an interruption only loses a small amount of time because you are restarting a small task. It’s OK to compare notes with others. It’s more valuable to get early review feedback on a draft of an article or a sketch for an interface than to perfect it in isolation only to have early readers or early prospects point out flaws that would have been visible much earlier in the process. Originally published at www.skmurphy.com on April 4, 2019.